Chinese influence in the Philippines can commonly be seen in the Filipino's food preferences. One on top of the list of food preference is the pancit (rice noodles), the name pancit (or pansit) was derived from the Chinese Hokkien pian i sit . In my curiosity, I have always gone to sites where photos of rice noodles are prepared in China, Thailand, Vietnam, Cambodia and other Asian countries look so delicious! They are the original countries that use Chopsticks instead of spoon, fork and knife. Pancit Bato is indigenuous to the Bicol Region; especially the town of Bato in Camarines Sur. Food in the Philippines are quite unique when it comes to its odor or aroma that is also uniquely appealing to the Filipino senses. Pinoys salivate to the aroma of those food while or after being cooked. These foods are like Tuyo or Daing (dried fish), the condiments are two types of Bagoong (some say similar to caviar) fermented salty tiny shrimps (alamang) or fish (monamon) and Patis (fish sauce) derived from drippings of bagoong fermentation. Many marginal Filipinos would be content to have these food and condiments with rice as their meal, in general, for the entire country. There are regional preferences on how the these are mixed with other food such as vegetables, spices or coconut milk. Some foreigners who taste or eat them complain of indigestion or stomach troubles but it usually is hypersensitivity to spices or coconut milk ingredients. Filipino food is a matter getting used to taste and smell. Most are health food, nutritious and filling with rice! Searching for dates online has been offered by many social websites. One website that specializes purely on dating is luvfree.com. Among the countries that have members registered with the site is the Philippines that rank third after the U.S. and the U.K. with most members. Filipinos are really active online and many seek to find partners for life on dating sites. The good thing with luvfree is that it is free to join and create a profile. Like other social networks, they have a messaging system, video chats, rating photos and others. Unlike other dating sites, luvfree services are absolutely free and no hidden fees or charges. The dating website is what many people like freebies like some Filipinos who would prefer to get things free or on trial first before getting into it seriously. The biggest concern for dating sites that charge or ask for a fee is you would not know if the person you meet online is for real. It is so easy for websites to create fake profiles to please members. Even video footage a member does not guaranty that it is the same person you have met on a dating site. With free services coming from luvfree, people know they don't lose anything and not worried to use credit cards to pay for fees or charges. It used to be that garbage collection was done by garbage trucks going around Baguio City to collect them. Many areas in recent years, if not all areas, residents have to bring their garbage in plastic bags to one place. So, if you happen to live in a house that disposes so much trash, you will have to carry them to the specified garbage collection location. If not, you just have to bear with all the waste for a week or so, until you get them there on the designated day/s. For garbage collection days, it seems that it is only the central business district of Baguio that have their garbage collected daily. A good number of residential and far-away areas have to settle for a once a week schedule. This is one reason why the City Camp lagoon area gets flooded. The people living around the area get lazy to bring their garbage to said places and instead just throw them in the water ways or other places where it can be carried away by rainwater. Baguio City has so many places of interest and tourist destination. One would be the Good Shepherd Convent located just beside another tourist spot - Mines View Park. The Good Shepherd Convent was known in the early days as a rehabilitation center for girls that have lost their way in life. It is being run by Sisters of the Good Shepherd. Right now it is a flourishing place and is making exceptionally well. 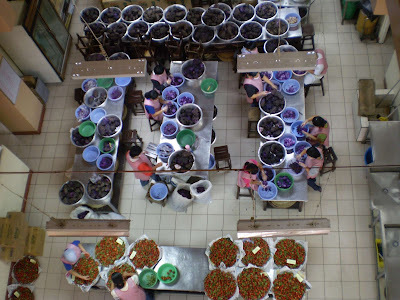 Their produce are Peanut Brittle, Ube jam, Strawberry and Blackberry/Blueberry jam. The place has developed into a virtual production plant of the said products. There was never a time I visited the place as early as 7 a.m. that there were no visitors. Many local tourists do not fail to buy goods before leaving for their respective cities or provinces. The Peanut Brittle is one of their products that is outstanding. Even locals still prefer them over the next best rival Romana's Peanut Brittle. The same with the Ube and Strawberry Jams. They have well secured production areas and not just anyone is allowed in there. Good Shepherd Convent has upgraded its facilities using Solar Panel lighting and Solar Thermal Water Heaters. The upgrade is to save on electric bills that they use in production. It is just amazing how they have developed into what they are right now. If you did not visit the place on your trip to Baguio City, make sure it will be on your agenda on your next trip!